AIM: Bone infection underlying diabetic foot ulcers requires accurate diagnosis to optimise management given substantial impact on patient morbidity, quality-of-life and healthcare costs. MRI is now the imaging modality of choice however, there is an increasing interest in the diagnostic performance of (18)F-fluoro-2-deoxyglucose positron emission tomography with computed tomography (FDG PET/CT) in detecting infection. The aim of this meta-analysis is to compare the diagnostic performance of FDG PET/CT with MRI in detecting diabetic foot ulcer osteomyelitis. METHODS: PubMed/MEDLINE and Embase databases were searched systematically for relevant MRI and FDG PET/CT studies. 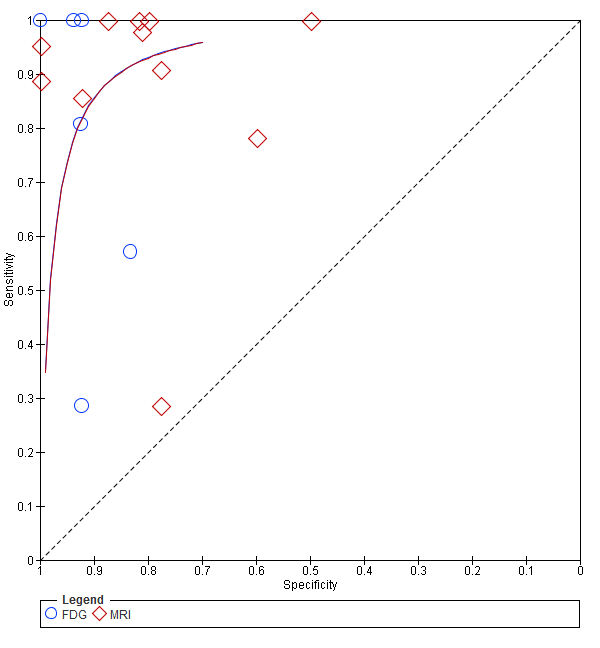 Two reviewers independently assessed the methodological quality of each study. Studies that were unable to provide per-patient level data were excluded. A meta-analysis of the reported sensitivity and specificity of each study was performed. RESULTS: The inclusion criteria were met by 3 FDG PET/CT studies, 8 MRI studies and 3 studies with both PET/CT and MRI; there was a total sample size of 214 patients in the FDG PET/CT studies. Overall, the studies had reasonable methodological quality. Pooled sensitivity and specificity of FDG-PET were 80.6% (95%CI = 69.1-89.2%) and 92.5% (95%CI = 87.0-96.2%), respectively. 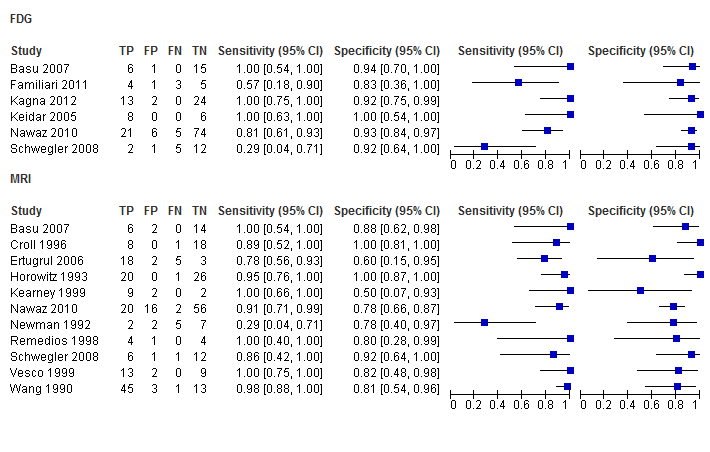 Sensitivity but not specificity was heterogeneous amongst individual FDG PET/CT studies (I-Square = 77.8%). Pooled sensitivity and specificity of MRI were 90.4% (95%CI = 84.9-94.4%) and 84.1% (95%CI = 78.2-88.9%). MRI studies were more heterogeneous in terms of sensitivity (I-Square 67%) and specificity (I-Square =56%). CONCLUSION: Overall diagnostic performance of FDG PET/CT is comparable to MRI, which are both accurate. FDG PET/CT may be more specific than MRI in patients with Charcot's osteoarthropathy. There is significant heterogeneity in terms of sensitivity for FDG PET/CT and both sensitivity and specificity for MRI studies, and therefore larger scale studies for direct comparison are warranted.